CD review: "Who's Gonna Save the World?" The Bodies gang strikes again! When Harvey Bodie opened a nightclub on University Avenue in San Diego in the early 1980s, a few miles south of San Diego State University, it quickly became the heart of the local music scene. The Beat Farmers, Mojo Nixon, the Paladins and the Outriders all were regulars there. 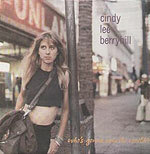 As was Cindy Lee Berryhill. Her debut is an absolute delight of country-tinged rock and folk. While she often played solo at Bodies, for "Who's Gonna Save the World," she's backed by a full band that sometimes intrudes on her music, but usually adds to it. with a belly like Jack Nicholson. Berryhill's voice isn't pure or strong; it's high and wavers a lot, almost to the point of breaking. But somehow the charm outweighs the drawbacks. On songs such as "She Had Everything" or "Spe-c-ial Ingredient," her voice works better than what a classically trained singer could ever bring. Production is by former Chick Corea sideman Steve Kujala, who also contributes several fine solos on recorder.